Munim Al-Rawi PhD, Carta Design Ltd.
Rumaila–West Qurna in the Middle East is one of the world’s greatest supergiant oilfields. What is a Supergiant Field? Location of the Rumaila–West Qurna field, southern Iraq. © OECD/IEA 2012 Iraq Energy Outlook, IEA Publishing A supergiant field is one that contains over a billion barrels of recoverable oil. With initial 2P recoverable reserves of 44.4 Bbo and 13.8 Tcfg in multiple stacked reservoirs, the Rumaila–West Qurna field, 50 km west of Basra in southern Iraq definitely falls into that classification. Encompassing an area of 2,400 km2 and extending 120 km from north to south and up to 20 km across, it is the largest oil and gas field in Iraq and one of the greatest fields in the world. Most geological structures in southern Iraq were delineated between 1947 and 1949 by seismic surveys carried out by the Basra Petroleum Co. (BPC), part of Iraq Petroleum Company (IPC). The South Rumaila field structure was drilled by BPC in August 1953. Oil flowed from the Lower Cretaceous Zubair sandstone reservoir, (the ‘Main Pay’), which had been previously discovered in the neighbouring Zubair field. BPC put South Rumaila into production in 1954. The North Rumaila structure was drilled in June 1959 as a northern step-out on the Rumaila axis, with the intention of delineating the northern plunge and exploring the extent of the Middle Cretaceous Mishrif carbonate prospects, as well as investigating the Zubair sandstones below the Main Pay. However, this reservoir was found at a higher level than expected; the Mishrif contained a productive oil reservoir; and while the Main Pay was productive, the sandstones below were waterlogged. BPC drilled another five wells on the structure before suspending drilling at the end of 1961, after the enforcement of Iraq’s infamous Law No. 80, whereby the government expropriated 95% of IPC’s concessions, temporarily putting a stop to exploration. In 1973 IPC was nationalised and the Iraqi National Oil Company (INOC) took over operations in the Rumaila fields. 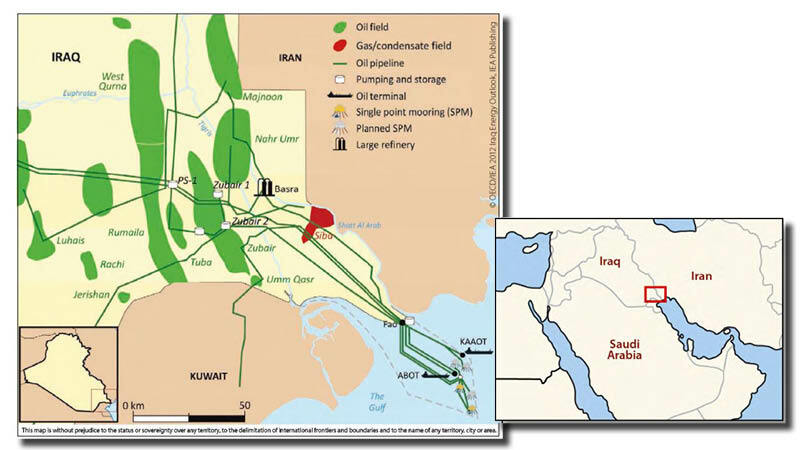 A comprehensive, up-to-date appraisal of the reservoir rocks, source rocks, seals and traps that control Iraq’s petroleum resources is reviewed by Munim Al-Rawi, an expert in the regional petroleum geology of the Middle East. Generalised stratigraphy of the Rumaila–West Qurna field. In the early ’70s a seismic survey confirmed the existence of a third dome on the Rumaila anticlinal axis, separated from North Rumaila by a shallow saddle. This northernmost dome, named West Qurna, was drilled by INOC in October 1973, and major reserves in the Middle Cretaceous Mishrif and Lower Cretaceous Yamama carbonate reservoirs were found. INOC began a deep drilling programme to look at the Yamama and the Jurassic Najmah carbonate reservoirs in the combined field and discovered the Ratawi/Yamama reservoir in 1976, the small Sulaiy reservoir in 1977 and the deeper Najmah reservoir in 1980. Additional seismic between 1981 and 1983, and further deep drilling in 1980 and 1983 by INOC confirmed the extension of the Yamama and Najmah reservoirs into the West Qurna field. During the years of exploration and delineation from 1953 to 1983, over ten petroleum oil and gas reservoirs , ranging in age from Miocene to Jurassic, were discovered in Rumaila–West Qurna, containing proven oil and gas in place reserves of 125 Bbo and 17 Tcfg. The three main domes of the supergiant field are separated by shallow saddles and the structure is tilted gently northwards. West Qurna and North Rumaila trend north-south, while the southern South Rumaila section trends north-north-west – south-south-east and extends southwards into Kuwait as the Ratqa field, where it is producing heavy oil from the Miocene Lower Fars reservoir. The flanks of the anticline dip at 1.5°–5° and are steepest on the western flank of West Qurna and North Rumaila and the eastern flank of South Rumaila. It is tighter at deeper structural levels, dipping 1.5°–3° in the Mishrif and 2.5°–5° in the Yamama Formations. The crest of the Mishrif reservoir at the three main culminations is at 2,190m (bsl) in West Qurna, 2,130m in North Rumaila and 2,150m in South Rumaila, while the Zubair reservoir is shallowest in South Rumaila at 2,940m, as compared to 2,975m in North Rumaila and 3,070m in West Qurna. At this level the saddle between South Rumaila and North Rumaila has up to 100m of structural relief, but the one between North Rumaila and West Qurna is less pronounced with about 25m relief. The Yamama reservoir in West Qurna has a crest at 3,515m bsl and the oil column is 46 m thick, with a lowest known oil depth of 3,980m. The shallowest well penetrations of the Yamama in North Rumaila and South Rumaila domes are 3,490m and 3,665m respectively. The reservoir is bottom-sealed by the tight limestones and shales of the Sulaiy Formation. At the top of the Yamama reservoir, the West Qurna Field covers an area of 735 km2. Only the Mishrif, Zubair and Yamama reservoirs are currently being developed or are producing in the Rumaila–West Qurna field. The Main Pay (Upper Zubair Sandstone), regarded as one of the most important reservoirs in southern Iraq, came on production at South Rumaila in 1954 and is still producing. It consists of three main sandstone units – AB, DT and LN – which have porosity around 20% and permeability about 600, 1,000 and 850 mD for the three units respectively. They are separated by shale and the net thickness of this reservoir is over 100m of mainly porous sand containing oil with 34° API and a sulphur content of 2 wt%. The hydrocarbons do not contain hydrogen sulphide. The Upper Zubair Shale Reservoir occurs above the Main Pay where the sandstone units in the upper shale part of the formation have good to moderate reservoir properties, deteriorating northwards where they are replaced by shale in the West Qurna field. The net thickness of this reservoir is 25m, with estimated porosity around 15%. It is not present in North Rumaila. Workers at the Rumaila field. Photo source: Rumaila Operating Organisation. In the North and South Rumaila fields, the Mishrif reservoir is known as the Second Pay and it is regarded as one of the main producing reservoirs in southern Iraq due to its huge reserves. It started producing in South Rumaila in 1975. The Mishrif consists of complex carbonate rocks composed in two units, MA and MB (the main unit), with porosity around 22%. The net reservoir thickness is 25m. There is not enough drive energy in the water aquifer on the flanks of the field, so water injection is required. The oil has 27.8° API and sulphur content is 3.8 wt%. The associated gas contains hydrogen sulphide. 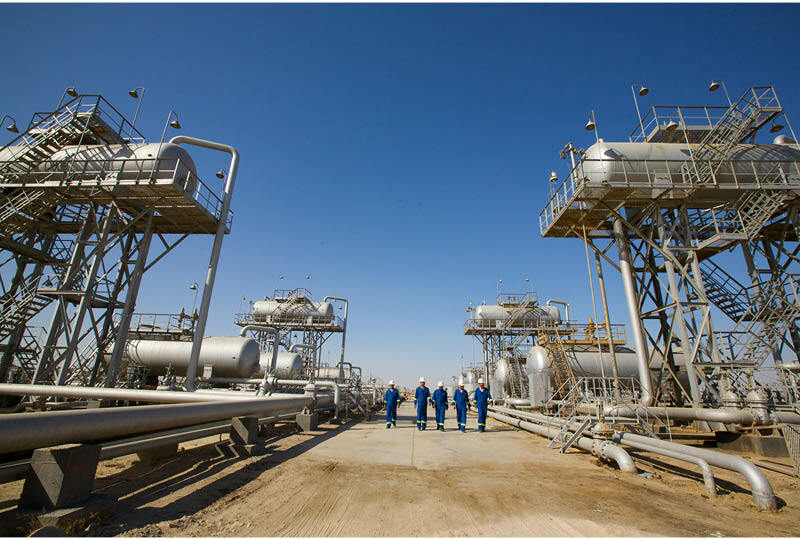 At North Rumaila, Second Pay production started in 1976. In this field the two main units are separated by a barrier unit. The oil is mainly found in unit MB, where porosity is ~16% and permeability 45 mD. This reservoir is regarded as continuous with the South Rumaila field, although with improved reservoir characteristics, particularly towards the north. Oil gravity is 26.3° API and sulphur content is 3.8 wt%, with associated gas containing some hydrogen sulphide. This crude is mixed with the oil in unit LN of the Main Reservoir to form Basra Medium Crude. This formation comprises at least seven recognised units of alternating limestone, each representing a depositional cycle. The upper unit, a thick porous permeable oolitic-peloidal limestone, is the most prolific, although the other units have sporadic oil saturation. The lowest unit contains heavy tarry oil. The thickness of the limestone unit containing oil is about 77m, with porosity around 14% and water saturation of 40%. Oil gravity is 37° API.The formation passes downward into organic rich black fissile shale (Sulaiy Formation). The Mishrif reservoir is believed to have held 48 Bbo in place, with 18.2 Bb initial recoverable reserves across the supergiant field, while Zubair had 40.2 Bbo in place and 16.4 Bb initial recoverable reserves. The Yamama reservoir holds 20 Bb of original oil and 5.9 Bb initial recoverable reserves in the North Rumaila and West Qurna fields only. 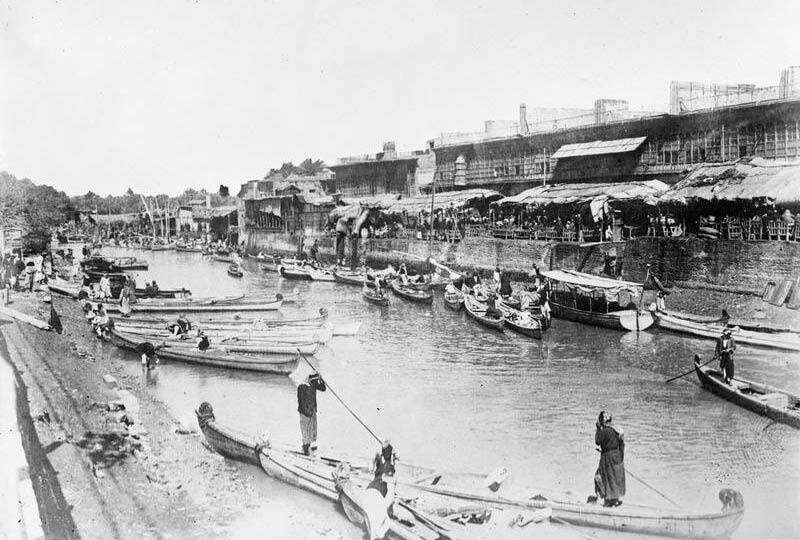 Ashar Creek in Basra during WW1. Photo source: Iraq Ministry of Information. Separate operators were involved in the initial development of the Rumaila– West Qurna fields, resulting in varied production rates. BPC began producing from both the Mishrif and Zubair reservoirs in Rumaila North and South in 1954 and by early 1962 it had drilled 33 wells in South Rumaila and six in North Rumaila. INOC took over the field operations after full nationalisation in 1973, starting production from West Qurna in 1976. By 1989 it had drilled a total of 221 wells in South Rumaila, 466 in North Rumaila and 266 in the West Qurna field, bringing the total in the whole supergiant field to 1,155. INOC operated the three fields until late 1987 when the Ministry of Oil re-organised it into several specialist operating companies, with Rumaila–West Qurna operated by the South Oil Company (SOC). A further re-organisation in 2017 meant that Rumaila–West Qurna is now operated by the new Basra Oil Company (BOC), in cooperation with international companies. Operations were temporarily halted several times; between 1981 and 1984 during the Iraq-Iran war; from 1991 to 1995 during the conflict and sanctions due to the occupation of Kuwait; and finally in 2003 after the Allied invasion of Iraq. 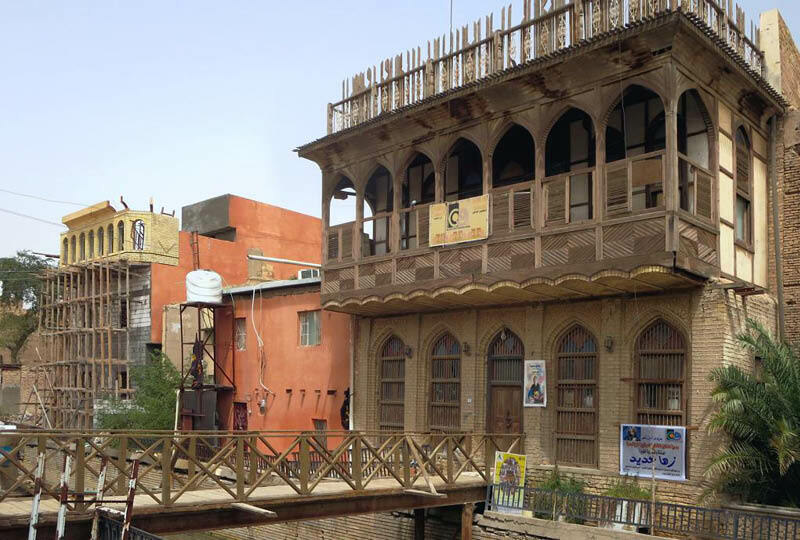 Rumaila – West Qurna is 50 km west of Basra, once regarded as the ‘Venice of the East’ because of its canals and houses with beautiful wooden balconies, known as Shanasheel. Photo credit: David Stanley. Although field rehabilitation had resumed, serious development of the huge potential of this unique supergiant field was only realised in 2009 with the award of service contracts during Iraq’s First Petroleum Licensing Round. Two licences on the supergiant field were offered in this bidding round, splitting it into Rumaila (North and South) and West Qurna. These called for the development of the producing Mishrif, Zubair and Yamama reservoirs, as well as of other discovered but undeveloped reservoirs, while also exploring for undiscovered potential reservoirs in the licences. In December 2009, West Qurna was divided into West Qurna 1, covering the area of the field north of the Euphrates River, and West Qurna 2 encompassing the area south of the river. Rumaila Operating Organisation (ROO), composed of BP, PetroChina and BOC, which operates the Rumaila (North and South) licence, reported in December 2016 that oil production at Rumaila is now at its highest rate in 27 years, producing over 1.45 MMbopd, up from 1 MMopd in 2009. Remaining contracted reserves are 17 Bbo. November 2009 West Qurna 1 was granted to an ExxonMobil-led consortium. The field has contracted recoverable reserves of 8.7 Bbo and currently produces around 405,000 bopd. The West Qurna 2 licence lies in the Hammar marshes area, which was extensively mined with explosives during the three military conflicts between 1989 to 2003. It was granted to a Lukoil-led consortium in 2009. It has contracted recoverable reserves of 14 Bbo and is currently producing around 545,000 bopd. In 2014 a multibillion-dollar water-injection project to help maintain pressure in the producing reservoirs in fields in southern Iraq, including Rumaila–West Qurna, was awarded to an ExxonMobil-led consortium. The project includes construction of a plant which will help six major oilfield development projects by producing 10–12 MMb (1.6–1.9 MMcm) of water per day. Despite having been on stream for over 60 years, it is believed that the Rumaila–West Qurna field still holds around 40 Bb of remaining recoverable reserves in both developed and undeveloped reservoirs. With the lifting of sanctions and the entry of international companies into operating this supergiant, it should be producing for many years yet. That is good news for the economy of Iraq and will hopefully bring thousands of jobs to this underdeveloped region. The Iraq Petroleum Company (IPC) was designed to explore and extract oil in the Middle East. Amid controversy about its role as the ‘Red Line Cartel’, its pioneering contribution to the oil development of the region is often overlooked. Knowledgeable but squabbling geologists; summary dismissals; camel transport; ‘lagoonal’ oil; and 40m-high gushers. All in a day’s work for the first oil explorers in Iraq. The Barnett Shale gas discovery changed an industry by unlocking huge new volumes of oil and gas from shales. The Brent Field is one of the most significant oil and gas discoveries ever made in the United Kingdom Continental Shelf (UKCS). The Cretaceous reservoirs of the Great Burgan field still account for most of Kuwait’s oil. Since the petroleum industry began in the mid-nineteenth century, numerous oil fields have been discovered and over 70,000 oil fields are still in use. Nonetheless, not all fields were created equally.